Remote sensing means acquiring and measuring information about an object or phenomenon via a device that is not in physical or direct contact with what is being studied (Colwell, 1983).To collect remotely sensed data, a platform – an instrument that carries a remote sensing sensor – is deployed. From the mid 1800’s to the early 1900’s, various platforms such as balloons, kites, and pigeons carried mounted cameras to collect visual data of the world below. Today, aircraft (both manned and unmanned) and satellites collect the majority of remotely sensed data. The sensors typically deployed on these platforms include film and digital cameras, light-detection and ranging (LiDAR) systems, synthetic aperture radar (SAR) systems, and multi-spectral and hyper-spectral scanners. Many of these instruments can be mounted on land-based platforms, such as vans, trucks, tractors, and tanks. In this chapter, we will explore the different types of platforms and their resulting remote sensing applications. Unmanned Aerial Systems (UAS) are revolutionizing how GIS&T researchers and practitioners model and analyze our world. Compared to traditional remote sensing approaches, UAS provide a largely inexpensive, flexible, and relatively easy-to-use platform to capture high spatial and temporal resolution geospatial data. Developments in computer vision, specifically Structure from Motion (SfM), enable processing of UAS-captured aerial images to produce three-dimensional point clouds and orthophotos. However, many challenges persist, including restrictive legal environments for UAS flight, extensive data processing times, and the need for further basic research. Despite its transformative potential, UAS adoption still faces some societal hesitance due to privacy concerns and liability issues. GIS&T exists within the national security enterprise as a multidisciplinary field that is now commonly referred to as Geospatial Intelligence (GEOINT). U.S. GEOINT operations are principally managed by the National Geospatial-Intelligence Agency (NGA). GEOINT is one among several types of intelligence produced in support of national security, along with Human Intelligence (HUMINT), Signals Intelligence (SIGINT), Measurement and Signatures Intelligence (MASINT), and Open Source Intelligence (OSINT). Primary technical GEOINT skill areas include remote sensing, GIS, data management, and data visualization. The intelligence tradecraft is historically characterized as a process involving tasking, collection, processing, exploitation, and dissemination (TCPED), and supports decision-making for military, defense, and intelligence operations. The GEOINT enterprise utilizes every type of data collection platform, sensor, and imagery to develop intelligence reports. GEOINT products are used to support situational awareness, safety of navigation, arms control treaty monitoring, natural disaster response, and humanitarian relief operations. Geospatial analysts employed in government positions by NGA or serving in the U.S. armed forces are required to qualify in NGA’s GEOINT Professional Certification (GPC) program, and industry contractors have the option of qualifying under the United States Geospatial Intelligence Foundation (USGIF) Certified GEOINT Professional (CGP) program. Figure 1. 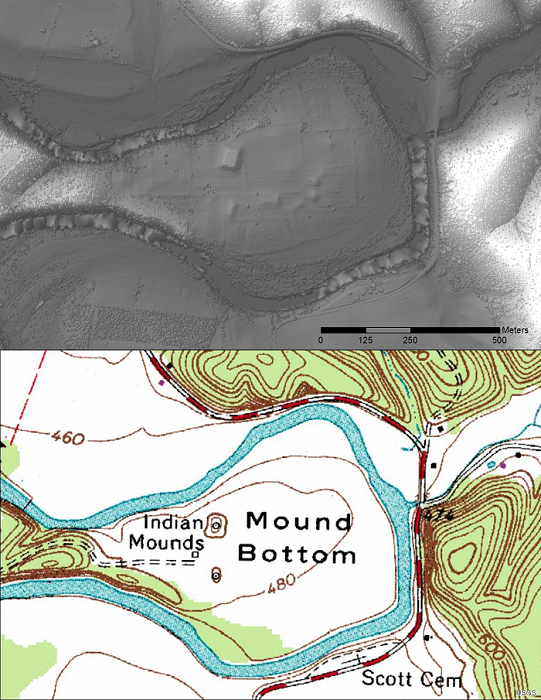 USGS topo map and bare earth (LiDAR) image of Tennessee’s Mound Bottom State Archaeological Area. Bare Earth DEM processed by Zada Law. Archaeology provides a glimpse into the lives of past peoples and histories that may have otherwise been forgotten. Geographic Information Systems and Technology (GIS&T) has become an invaluable tool in this endeavor by advancing the identification, documentation, and study of archaeological resources. Large scale mapping techniques have increased the efficiency of site surveys even in challenging environments. GIS&T refers to such things as remote sensing, spatial analysis, and mapping tools. The use of GIS&T for archaeology is a truly interdisciplinary field as it borrows principles from geology, oceanography, botany, meteorology and more in order to further the science. This chapter discusses some of the primary GIS&T tools and techniques used in archaeology and the primary ways in which they are applied.